Newly revealed text messages between FBI paramours Peter Strzok and Lisa Page include an exchange about preparing talking points for then-FBI Director James Comey to give to President Obama, who wanted “to know everything we’re doing." The message, from Page to Strzok, was among thousands of texts between the lovers reviewed by Fox News. The pair both worked at one point for Special Counsel Robert Mueller's probe of alleged collusion between the Trump campaign and Russia. Page wrote to Strzok on Sept. 2, 2016, about prepping Comey because "potus wants to know everything we're doing." According to a newly released Senate report, this text raises questions about Obama's personal involvement in the Clinton email investigation. 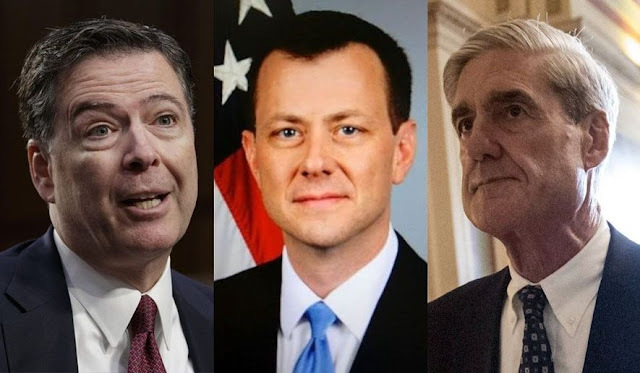 In texts previously revealed, Strzok and Page have shown their disdain for Republicans in general, as well as Trump, calling him a "f---ing idiot," among other insults. That text came from Strzok to Page on Nov. 4, 2015, the day after Jill McCabe lost a hotly contested Virginia state Senate election. Strzok said of the result, "Disappointing, but look at the district map. Loudon is being gentrified, but it's still largely ignorant hillbillys. Good for her for running, but curious if she's energized or never again." The newly uncovered texts reveal a bit more about the timing of the discovery of "hundreds of thousands" of emails on former Congressman Anthony Weiner's laptop, ultimately leading to Comey's infamous letter to Congress just days before the 2016 presidential election. On Sept. 28, 2016, Strzok wrote to Page, "Got called up to Andy's [McCabe] earlier.. hundreds of thousands of emails turned over by Weiner's atty to sdny [Southern District of New York], includes a ton of material from spouse [Huma Abedin]. Sending team up tomorrow to review... this will never end." According to the Senate report, this text message raises questions about when FBI officials learned of emails relevant to the Hillary Clinton email investigation on the laptop belonging to Weiner, the husband to Clinton aide Huma Abedin. It was a full month later, on Oct. 28, 2016, when Comey informed Congress that, "Due to recent developments," the FBI was re-opening its Clinton email investigation. "In connection with an unrelated case, the FBI has learned of the existence of emails that appear to be pertinent to the investigation. I am writing to inform you that the investigative team briefed me on this yesterday..." Comey said at the time. The question becomes why Comey was only informed by his investigative team on Oct. 27, if the Clinton emails on Weiner’s laptop were discovered by Sept. 28, at the latest. Other texts show more examples of the officials' opposition to Trump. On Election Day 2016, Page wrote, "OMG THIS IS F***ING TERRIFYING." Strzok replied, "Omg, I am so depressed." Later that month, on Nov. 13, 2016, Page wrote, "I bought all the president's men. Figure I need to brush up on watergate." Page’s meaning here is unclear, but Senate investigators say, coupled with Strzok’s Aug. 15 text about an “insurance policy,” further investigation is warranted to find out what actions the two may have taken. The last text is from Page to Strzok, and comes on June 23, 2017, when she wrote, "Please don't ever text me again." It's unclear whether she was mad at her friend, or if she suddenly became aware that they, and their thousands of texts, had been discovered. Jake Gibson is a producer working at the Fox News Washington bureau who covers politics, law enforcement and intelligence issues. Are Democrats destroying their own credibility?